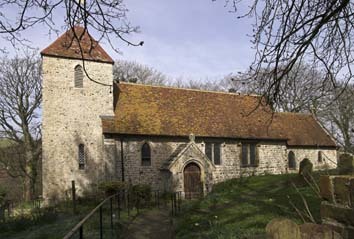 The nave and chancel are C11 or C12 with a tower and north arcade of c1200. Most windows, the north chapel and the aisle walls are C19. Though near the coast and behind the despoiled area between Brighton and Newhaven, Telscombe village has been saved because it is approached from the north across two miles of Downland lane and is thus almost the only village in the area that is not located on or near the estuary of the river Ouse. The church stands on a slope and the proportions of the flint nave and chancel look C11 or C12, though no detail remains. The small south east window of the chancel may have been converted from an older one in the C14 and though the mouldings of the south doorway are C14, its almost round head suggests it too could have been adapted. 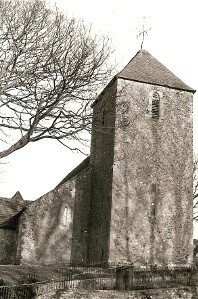 In the late C12, a tower and north aisle were added. The unbuttressed tower with a tiled cap has a round-headed west lancet and smaller pointed bell-openings; a further round-headed lancet to the south looks entirely C19. 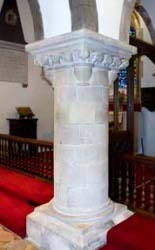 The tower too is built of flint, but with a plinth of ironstone. The plain, unchamfered pointed tower arch extends the full width of the tower. The aisle also has a single round-headed west lancet. The Sharpe Collection drawing (1802) shows no other window and the north wall was rebuilt in the C19. The arcade has round piers, a semi-circular east respond and a square west one. Probably at least started before the tower, the heads of the plain arches are round. They do not fit the piers and the VCH (7 p77) suggests they have been rebuilt. The date of this is not obvious, for though retooled, they do not look C19, although the history of the church then is poorly documented. 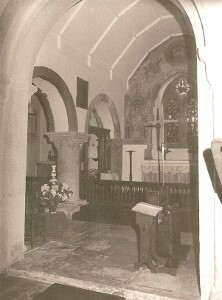 On the other hand, the chancel arch, despite a round head of C12 form, is C19; the form of its predecessor is unknown. The north chancel chapel was also added in the C12 and is little wider than the then aisle. 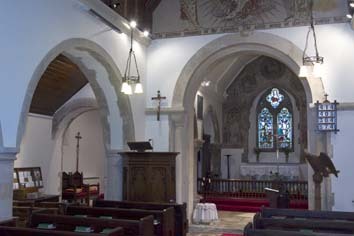 It is approached from the aisle through a round-headed arch, visible on the Sharpe drawing. The two-bay arcade to the chancel is reconstructed, for it is shown blocked in the Burrell Collection drawing of 1780, though it is not known when the original chapel was removed. The heads are again plain and rounded, but the capitals of the responds (as in the nave arcade, the west one is square and the east one semi-circular) are slightly later than the nave arcade, with scallops and crockets. It has been suggested (www.crsbi.ac.uk retrieved on 22/4/2013) that the west respond is rather earlier in date, but in view of the degree of restoration, this is open to question. Similar doubts centre on the square capital of the round pier, which like the east respond has pendants in the angles. 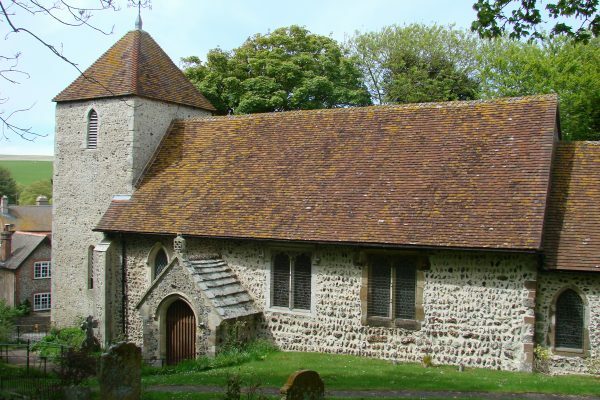 In this respect, it resembles others in the area of the same date, e g St Anne, Lewes. However, the pier has certainly been renewed, though since much of the east respond appears old, the form of the capital also may be original. The C14 large south lowside lancet of the chancel may be adapted from a C13 one. The remaining C14 work is early, including the well preserved east window with a quatrefoil head, the south east window of the chancel and the south doorway, which may be adapted from C12 work. The only C15 work, at least originally, is the two-light square-headed south east window of the nave. The adjacent one with different dimensions is wholly C19. Though no early representation of the south side is known, all the present windows are C19, including the big south west lancet. It is probable that the windows that were here previously were, except the C15 one noted above, different. In the C19 the north aisle was reconstructed higher and wider (as the west wall shows) and the rebuilt chapel was taller with a gable. In 1851, Nibbs writes of a recent restoration and it was most probably on that occasion that the external detail was renewed, for the work is known to have included the ‘complete restoration’ of the north aisle. Furthermore, Hussey (published in 1852) notes its new dimensions and Lower (II p199) states that the chapel had been recently replaced. The chancel arch, aisle wall and other external detail also probably date from this time. It is tempting to ascribe the roofs to a further restoration of 1902 (Harrison p125), for the twisted iron ties in the nave are more typical of that date. This campaign of work appears to have continued for several years, since the second nave south window in C15 style is said to date from 1904 (as does the glass in it – see below) (BE(E) p632) and the chancel wall-paintings were added in 1905 (ibid). 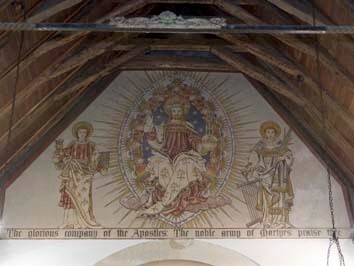 The only recorded work subsequently was in 1937, when the north chapel was fitted up (ibid). 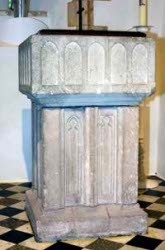 Altar: (North chapel) Stone and C19 in appearance, with pierced flamboyant tracery on the front. It was brought here from Verona, Italy in 1937 (BE(E) ibid). Altar rails: Either C18 or a good modern copy with closely set balusters. 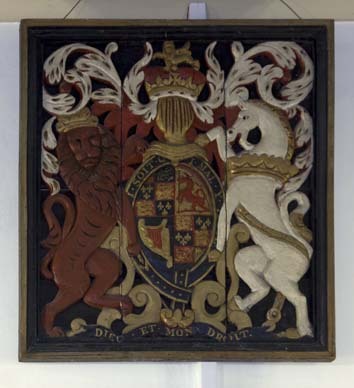 Bench ends: (Now part of the priest’s stall and kneeling desk) C16. Font: A C13 square bowl with five pointed arches cut into each side. On each side of the solid base are two small trefoiled recesses. 1. (South chancel, second window) J Powell and Sons, 1892, designed by F Mann (Hadley list). 2. (South chancel, first and north aisle first and second windows) Attributed to Wailes and Strang on account of the close similarity to their documented work at Piddinghoe nearby (www.stainedglassrecords.org retrieved on 29/3/2013). 3. (South aisle, first window) J Powell and Sons, 1853, quarries (Cash book). 4. (West window) J Powell and Sons, 1878, more quarries with roundels in each light (Order book). 5. (South nave window) Clayton and Bell, 1904 (BE(E) ibid). 6. (North chapel, east window) Fragments of older glass said to come from Selby abbey, Yorkshire, placed here in 1937 (BE(E) ibid). 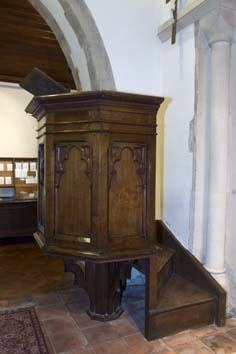 Lectern and desk: These incorporate pieces of C15/16 woodwork, including pew ends in the desk. Monument: (South wall of nave) Thomas Crew (d1782) and other members of his family, ending with Richard Day (d1816). It is an oval tablet, signed by A Lambert of Brighton, who is otherwise unknown, and probably dates from after 1816. 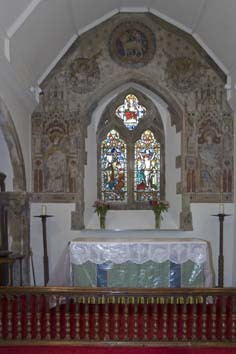 Painting: (Above chancel arch and on east wall) This dates from 1905, showing pre-Raphaelite influence, by Clayton and Bell (BE(E) ibid). Piscina: (South chancel) restored C12 work with carved leaves under the square bowl. Royal Arms: (Over south doorway) Finely carved in low relief and possibly late C17 since the arms of Hanover are lacking. Stoup: (By south doorway) Not old in its present state.